In the spring when we were discussing with the girls the fact that we would be visiting 2 of the nation’s 3 biggest cities this year, Sunny had an interesting question: what’s the smallest city in the country? This led to a fun google search about the towns in the United States with the smallest population. While it appears there is a town in Nevada with a population of 0 (there are businesses but everyone lives outside of city limits) the next smallest with a population of 1 is Monowi, NE. 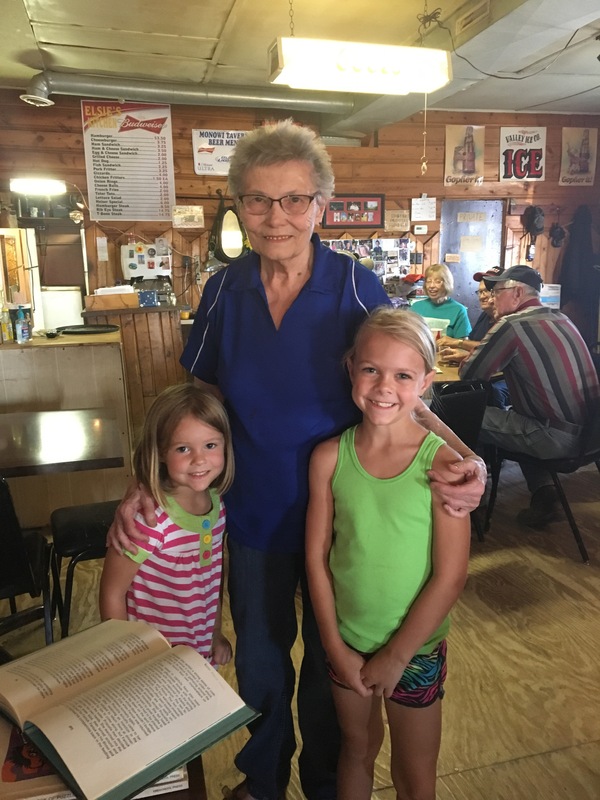 From an online list of the nation’s smallest towns written in 2015, we learned that the town’s sole resident is an 83 year old woman named Elsie who runs the Monowi Tavern as well as a small library. We circled the location on our wall map, hopeful that we might be able to pay a visit. As we crossed the northern states and needed to decide our route, I tried my best to look online to confirm that the tavern was still open. The 2015 article said that Elsie became the sole resident in 2004 when her husband Rudy died. But she was 82 when the article was written, and she was considering moving to Omaha where one of her children resides. I didn’t want to plan on this being our main destination in Nebraska only to arrive and find that the town had completely disappeared. In the absence of a website, I was able to find the tavern phone number on yelp, and called it one morning to see if she was still in business. “Hello?” was her answer. I suppose if you’re calling this number, you know who is answering, so no introduction is required. I was sold. From our campground in Mitchell, South Dakota one afternoon when temps were pushing the upper 90’s, we loaded in the truck for the 100 mile drive to Monowi. We passed a number of towns along the way. Population signs boasted 140, or 29, or 7. I’m sure that all of these places have their stories too, but they weren’t the stories that we were driving 100 miles to hear. We walked into the Monowi Tavern about 4:00pm. As we opened the door and entered, the group of older men and women at the round table in the rear of the dining room stopped their conversation and turned to look at us. I recognized one face from the online article as Elsie. “Hello. Are you Elsie?” I asked as we approached the table. “Yes, I am,” she replied with a smile. She said she’s never owned a computer so she doesn’t even see the things that have been written about her online. She got out her guest book for us to sign and asked where we were from. When we said we were from Washington, I think she was a bit disappointed. “Since I started keeping these guest books in 2005, I’ve had guests from all over the world.” She started naming off a number of foreign countries. “But I’ve only had guests from 47 states. I’m still missing Rhode Island, Delaware, and West Virginia.” So she is on the hunt. We told her we would like to check out the library and then come back for dinner, so she gave us the key and we went next door. Rudy’s Library is a metal building between the Tavern and Elsie’s house that is filled nearly to bursting with books. There was no air conditioning, so the inside was only a few degrees below the outside Nebraska afternoon temperature. We clicked on a light switch that also turned on a small ceiling fan, whose click click click click as we explored the small room did nothing to decrease the heat, and somehow didn’t even seem to create a breeze. Wall to wall shelves were packed with both new and very old books. On a small desk near the door there was a very faded framed picture of an old man, and a wooden plaque on the wall behind it that read “Rudy’s dream”. You could tell that this place had been originally set up with great love and care. In the years since, however, it has been a bit neglected. Being the sole employee of the tavern keeps Elsie hopping, so the library has developed some cobwebs – literally. The corners were a smattering of dust and dead bugs. Bags and boxes of donated books that no one had the time to unpack were scattered across every surface, and stacked up on the table in the middle of the room. 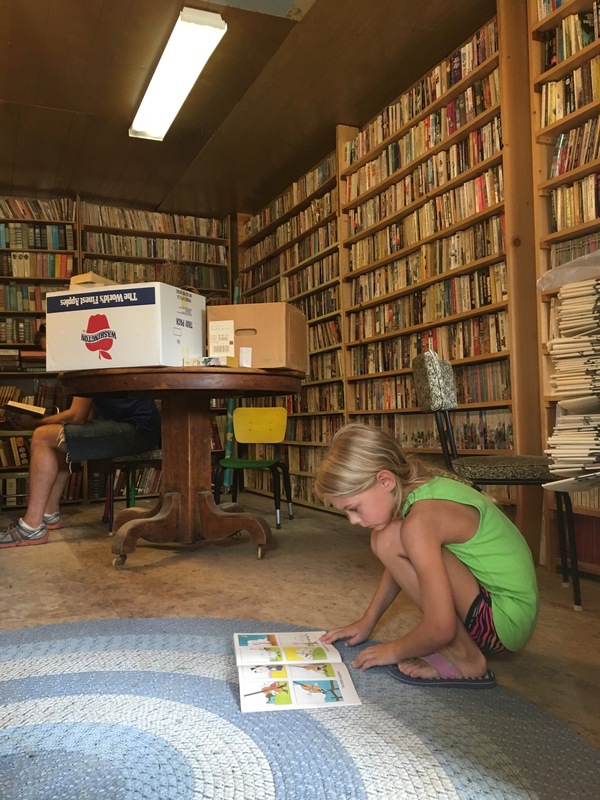 We dusted off some chairs and rearranged some stacks of books to create a space for us each to flip through some pages of a few books. The girls found an old set of dominoes and made small arrangements on the rug directly beneath the ceiling fan, possibly the coolest spot in the room. We found old dictionaries, books on short hand, as well as some modern classics. We could have all explored longer, but after about an hour the heat had become pretty oppressive, and since Sunny is our fainter we decided to move on when she became particularly red-faced. We toted a few of the books back with us over to the tavern to read while we had dinner. When we returned to the restaurant, the party size at the table of regulars had doubled. It was Elsie, two other women that looked enough like her that they might have been related, and about 5 old men that looked like they had been working in the field of Nebraska every day for their life. They were periodically helping themselves to the beer in the fridge in the corner, and it appeared they were stacking up their bottle caps to keep track of their tab. They were having robust conversations about this, that, and taxes. Elsie brought us all ice water, and we started to slowly cool down enough to feel hungry. A few other people came in and out while we were there. Most seemed to be on a first name basis with Elsie. A couple of farmers met for a beer at the bar. A man and woman came in for burgers. A family with young kids came in to buy pop and chips and candy off the snack table and then continued on their way. Another man sat and ate alone. Elsie managed on her own to take all the orders, prepare all the food, run the register, clear tables, and still have moments to sit and talk with the table of her friends from time to time. I noticed that when Elsie was particularly busy, the regulars would get up and clear a table, or take a plate to a customer. The menu was simple: hot dogs, burgers, pizza, grilled cheese sandwiches, and various fried side dishes like tater tots, fries, and onion rings. All four of us ate our full, plus a couple of drinks, and our dinner was still only $20.00. We sat there quite a while, enjoying our food and the air conditioning, and continuing to flip through some books from Rudy’s library. By the time we were ready to go, everyone else had gone, including the table of locals. We started asking Elsie about the library. 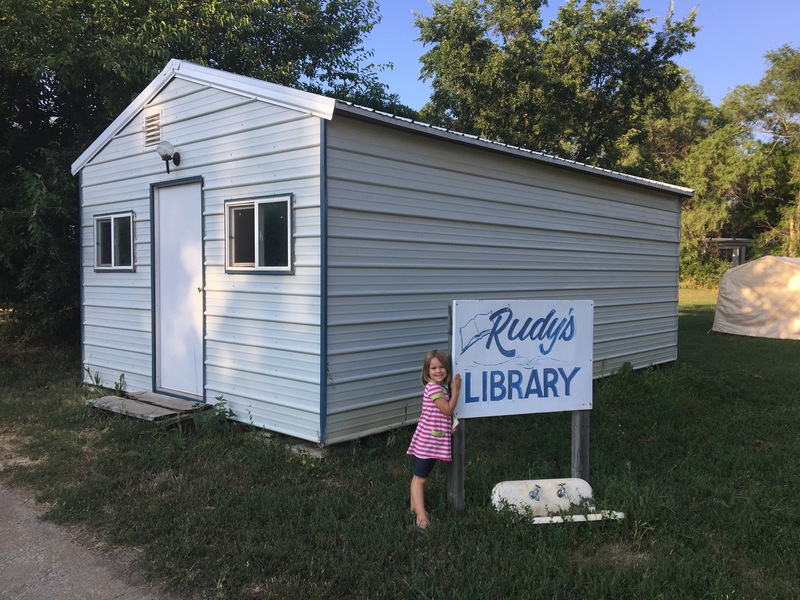 She said her late husband, Rudy, had always wanted to have a community library. He had collected books for years. They got the building in place and had just finished all of the carpentry work for the shelves when Rudy passed away. 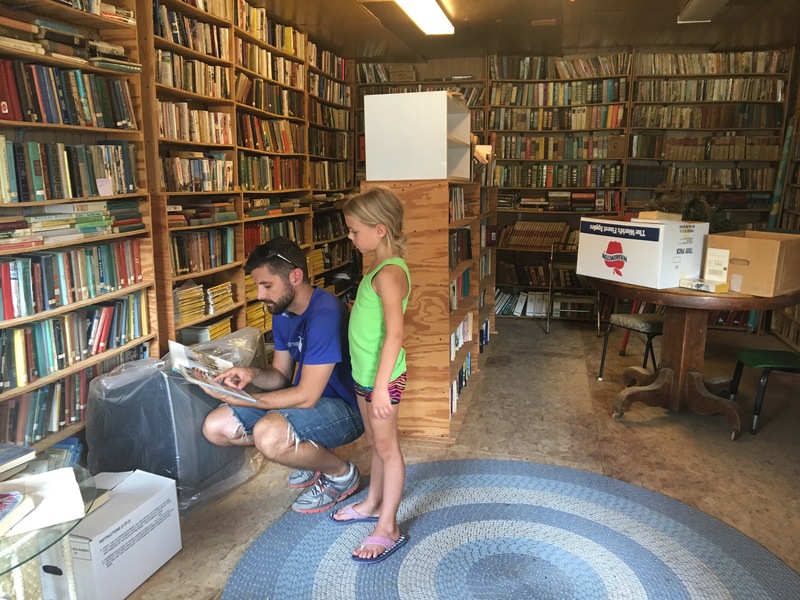 Their children finished putting all of the books inside, but he didn’t get to see it completed. We asked Elsie some questions about the town history and she went to the back to bring out her photo albums. She has black and white photos of the town in its prime – the early 1900s. There were pictures of the old western downtown, with wagons and people bustling down the dirt of Main Street. She pointed out the train tracks that came right through town, near the 2 grain elevators. She pointed out the old building that she said she thinks could be the current tavern building. There are photos of the interior too; multiple bar tenders with small neat mustaches, and patrons around a table, some civilized in suits with spectacles, others burly-looking in giant fur coats. She said that she thinks the cash register in the photos is the one she still uses. She said that within her lifetime, the town had once been as large as 120, and at one point had an elementary school. 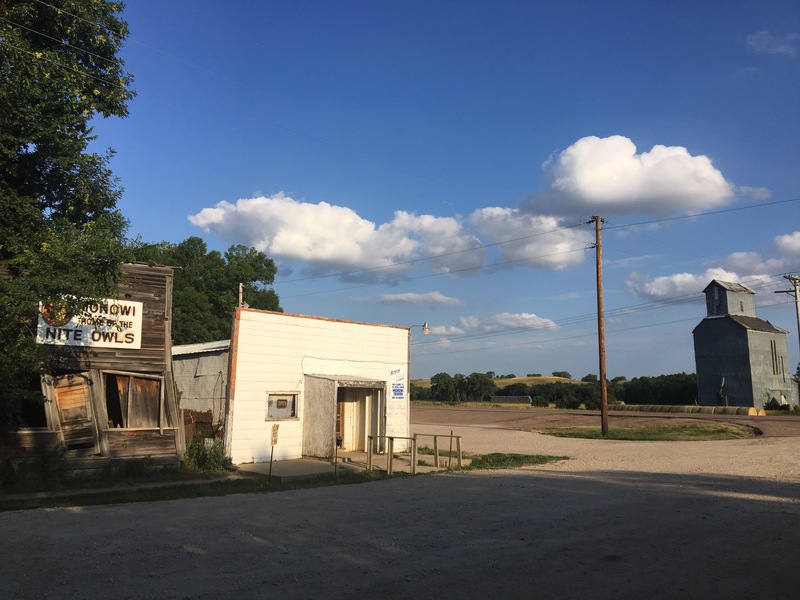 Over the years as the small family farms became 1000-acre industrialized operations, the families slowly but steadily moved out until it was just the the 2 of them – Rudy and Elsie. 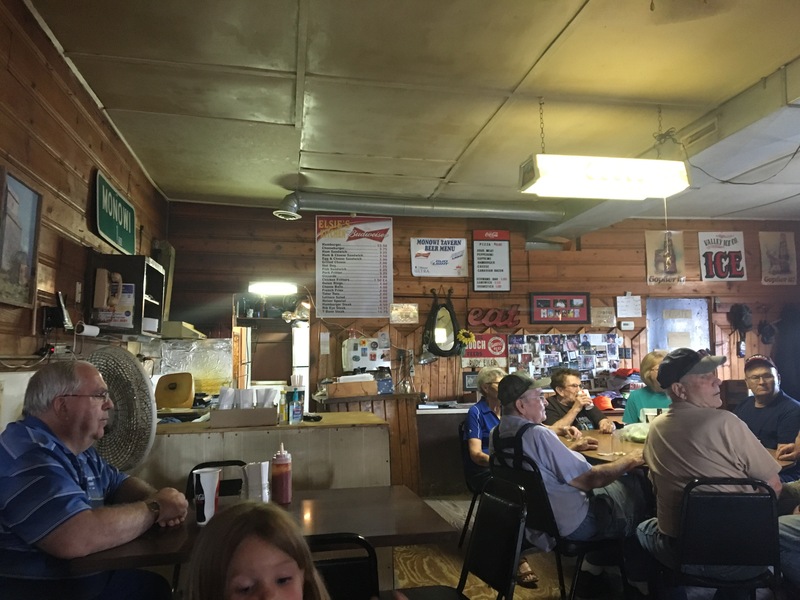 They ran the Tavern for 46 years, selling paraphernalia boasting “Nebraska’ Smallest. Monowi 2.” To the regulars as well as travelers passing by. She said that for years after Rudy’s death, she left all of the merchandise the same. Monowi: 2. She didn’t like the idea of changing it. But eventually the sign on the highway was changed to 1, and at her friends’ insistence she ordered new swag. I asked what she thought the future of the tavern would be. She said that one of her sons likes the idea of taking it over once she’s gone, but he already has a life elsewhere, and if the restaurant ever changes hands it will cost a lot of money to get it up to code. “I’m grandfathered in, you see.” The floors are pieces of plywood, some of which are slightly curled at the edges. The bathroom is a vault toilet outside, and I’m not sure that there was any running water in the whole place, but she made us the best burgers we’d had in ages. Is there nothing new here? Friends meeting for their daily rants about taxes. Travelers stopping for a bite. An old lady showing off her photo albums? This could be any town. But this one is Elsie’s, although I think being the sole resident is a mixed bag for her. 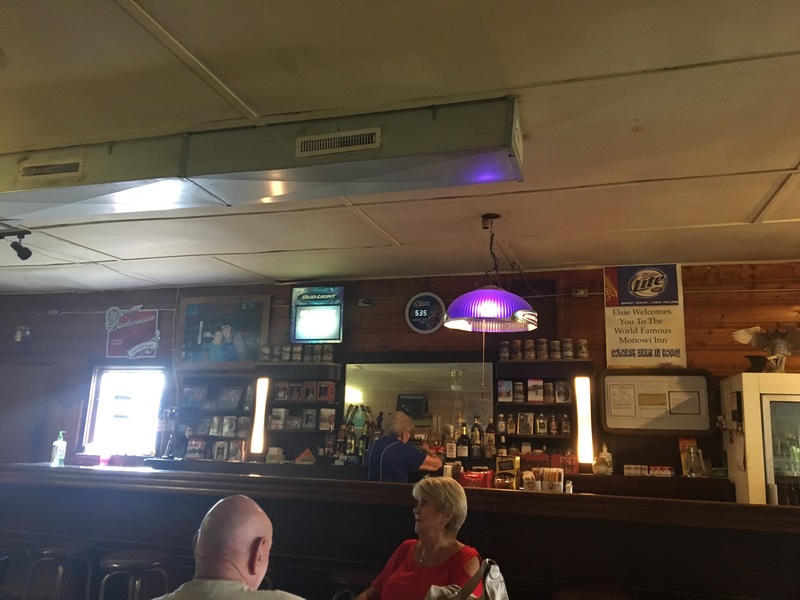 Many of the old city limit signs, with the population number ever decreasing, adorn the walls of the tavern. There was one that said 29, and one that said 5. But right above the space where Elsie stands to prepare food is the one I bet is her favorite. The green highway sign that would have once been displayed about 100 yards up the highway says “Monowi: 2”. Thank you for sharing. 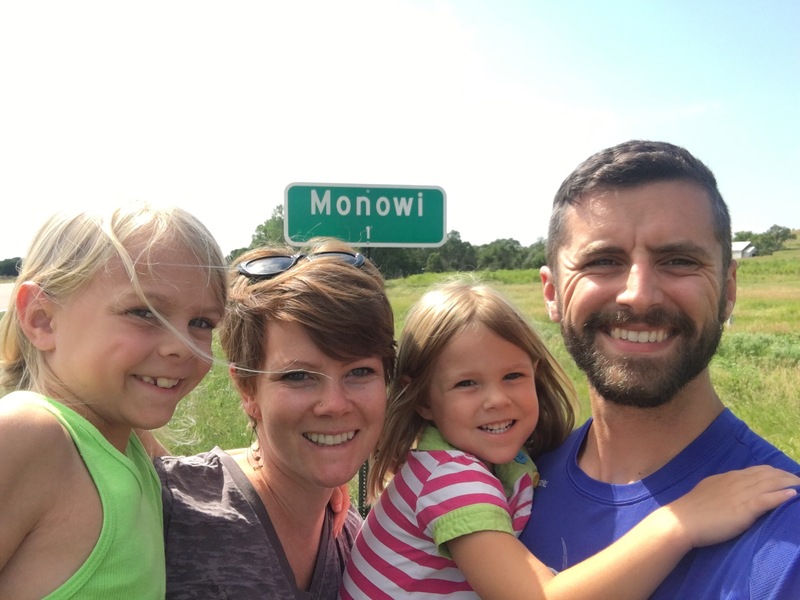 I have driven through small towns in Kansas that are close to the size of Monowi. Nice to remember it is not about the towns size but really about the people who live there.